CHEMAF has constructed a market place at Commune de Ruashi, close to the Etoile Mine to provide well-designed stalls for more than 120 local micro-enterprises who sell handicrafts and carvings made from stones such as green Malachite and wood sourced locally. The market is visited by foreign people and visitors from the region who are looking for local souvenirs. 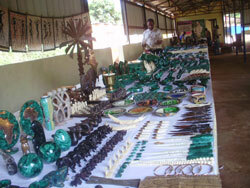 The craftsmen have a variety of products from paintings to jewellery and handicrafts. It's an excellent opportunity for small businessmen to have a platform to sell their goods and support their families in gainful employment.